In the past few months, a new material has come into light – aerographite. The structure is an interconnected network of closed shelled microtubes. The walls of these tubes are approximately 15 nanometers thick but have a tube diameter in the order of a micron or more. Unlike multiwalled carbon nanotubes, the microtubes show less curvature. The tube surface can be modified by growth conditions to introduce wrinkles that increase mechanical stability. It is processed from ZnO powder that is heated to 900°C. This transforms the ZnO to a three dimensional network of nanocrystals and microcrystals. This is then placed into a chemical vapor deposition reactor where carbon and hydrogen rich gas sources are introduced at a chamber temperature of 760°C. Aerographite can currently be fabricated up to a volume of several cubic centimeters. hydophobic so will wet well to epoxies. Electronics for aerospace applications. The low density property means low acceleration forces which is ideal for high impact and high vibration environments. Electrode for Li ion batteries. Mechanical robustness, high surface area and low specific weight are all beneficial properties for this application. Graphene is one of a handful of advanced materials that when successfully manufactured on a large scale and integrated will transform many areas of industry including (but not limited to) electronics, construction, and optics over the next several decades. Graphene is a single-atom thick sheet of sp2-bonded carbon atoms that make up a hexagonally closed packed two-dimensional lattice. From this description, it is clear to see that this material offers a very high surface to volume ratio. It will have very different in-plane properties compared to out of plane properties. It is easy to guess it is very strong (in-plane tensile strength is 200 times that of steel). 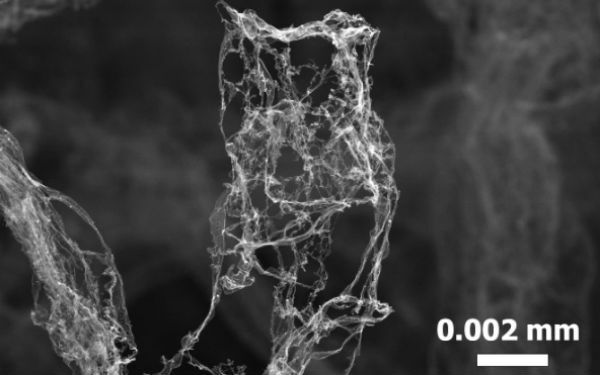 It is basically an unzipped carbon nanotube. Graphene is a material with a unique combination of properties. These include electrical properties such as high electron mobility (15,000cm2V-1s-1) which is nearly temperature independent from 10K to 100K. It has a sheet resistivity that is less than silver (10-6W) and yet is still transparent at visible wavelengths. Optical properties include a voltage tunable band gap and the nonlinear Kerr effect. Notable thermal properties include an in-plane conductivity similar to diamond (1000W/mK). Mechanical properties include a tensile modulus of 1TPa. It can also be stretched at 20% of its length and still maintain structural integrity. According to a Frost and Sullivan March 2012 report titled “Advances in Graphene Technologies – Emerging Business Opportunities”, manufacturing of large sheets of high quality graphene is a key bottle neck for its integration into the electronics industry. They estimate that this should be achieved in four years (if not sooner). Collaborative efforts between companies and academia have developed and are seen as key in making progress in manufacturing challenges. These include the Graphene Flagship and the Korean Graphene Hub. It is estimated that graphene-enhanced products will be the first to reach the market and that graphene-enabled products will follow about a decade later. Historically, materials have defined an era such as the Stone Age, the Bronze Age and the Iron Age. In modern times, technology is advancing rapidly. Understanding how materials behave (mechanically, thermally, electronically and chemically) is often times critical to getting the final product to operate within desired specifications. Applied Materials Applications, LLC. (AMA) is focused on understanding your materials problems and delivering solutions that work for your product. The integration of new materials into products to advance the state of the art. The innovation of products through integrating conventional materials in a new way. Our services include in-depth analysis of materials problems, on-site visits, phone consultations and presentations by an expert Materials Scientist and Engineer versed in a wide scope of materials.